Persistence Market Research analyzes the India Pallets market over an eight year period from 2016 to 2024. The study demonstrates market dynamics and trends across regions that are expected to influence the current status and future prospects of the India Pallets market over the forecast period (2016 - 2024). The primary objective of the report is to offer information on market drivers, restraints, trends, opportunities, and value chain analysis; and updates on developments in the India Pallets market. The report conducts a quantitative as well as qualitative assessment of the India Pallets market by material type, by structural design, and by end user. This report provides the analysis of the India pallets market in terms of market value (INR Cr/US$ Mn) and volume (thousand units). The report starts with a market overview and provides market definition and analysis of the drivers, restraints, opportunities, and key trends influencing the India Pallets market. Impact analysis of key growth drivers based on the weighted average model is included to better equip clients with useful decision-making insights. The subsequent sections analyze the India Pallets market and present a pricing analysis of the India Pallets market by product type, segments, sub-segments, application, and region. For market data analysis, the report considers 2015 as the base year, with market numbers estimated for 2016 and a comprehensive forecast made for the period 2017–2024. 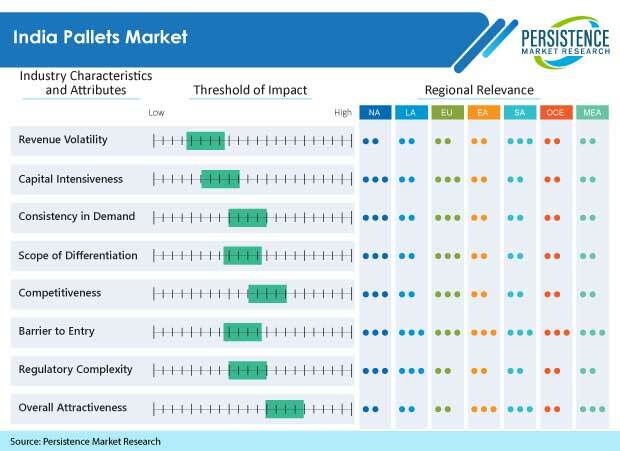 The final section of the report presents a competitive landscape of the India Pallets market to provide report audiences with a dashboard view of leading market players operating in the India Pallets market, along with information on their market performance, SWOT analysis, and key business strategies. Some of the top market players featured in the report include Mekins Group, Schoeller Arca TIME Material Handling Solutions, Doll Plast Pallets, JIT Wood Packaging, DNA Packaging, Swift Technoplast Pvt. Ltd., Saraswati Engineering Ltd., LEAP India Pvt. Ltd., Bharadwaj Packaging Pvt. Ltd., Spanco Enterprises, Aristoplast Products Pvt. Ltd., and B.D. Industries (India) Pvt. Ltd.
To compute the market size, the report considers various points based on secondary and primary research. Additionally, key data points like market split in terms of material type, structural design and the end use have also been considered. Qualitative inputs from industry experts have been incorporated to arrive at appropriate market estimates. The forecast provided in the report includes the actual market value generated in 2015 and the expected market value forecasted till 2024 in India. When developing a market forecast, the report begins with sizing the current market, which forms the basis for forecasting about how the market is anticipated to take shape in the near future. Given the characteristics of the market, PMR triangulates the data via different analysis based on supply side, demand side, and dynamics of the India Pallets market. However, quantifying the market across the above mentioned segments is more a matter of quantifying expectations and identifying opportunities rather than rationalizing them after the forecast has been completed. Given the ever-fluctuating nature of the global economy, the report presents forecasts not only in terms of CAGR, but also analyzes the India Pallets market on the basis of key parameters such as Year-on-Year (Y-o-Y) growth to understand market predictability and to identify the right opportunities in the India Pallets market. The report also analyzes the India Pallets market segments in terms of Basis Point Share (BPS) to understand individual segments’ relative contribution to market growth. This detailed level of information is important to identify the many trends governing the India Pallets market. Another key feature of this report is a comprehensive analysis of the India Pallets market revenue forecast in terms of absolute dollar opportunity, critical in assessing the level of opportunity that a provider can look to achieve, as well as to identify potential resources from a sales perspective in the India Pallets market. In order to understand key growth segments in terms of growth and performance of the India Pallets market, Persistence Market Research has also developed a market attractiveness index to help providers identify real market opportunities in the India Pallets market. As the Indian economy expands, the pallets market in India is poised to grow substantially. Pallets are load bearing structures that serve as a rigid base for the transportation and storage of various materials and products that make up as the unit load. These pallets are usually handled by forklifts or pallet jacks. In most of the cases, pallets are rectangular in shape and occupy an area of one square meter or more. The India pallets market is projected to register a CAGR of 13.9% in terms of value over the forecast period of 2016-2024. In 2016, the India pallets market was valued at INR 6,223.1 Cr. (US$ 971.9 Mn). A robust growth of the manufacturing sector in India is an important market driver increasing the use of pallets in the Indian market. The manufacturing sector in India is poised to take off and exhibit a sustained growth due to the government initiatives like ‘Make In India’ and the rollout of the GST tax structure in the coming years. Such kind of reforms are likely to have a positive impact on the manufacturing sector in India. Due to the fillip received in the manufacturing sector, the development of the warehousing industry is likely to receive a major boost, and as a direct consequence of this, the pallets industry in India is likely to grow significantly. In addition, the growth in demand for safe transportation of goods and various materials is likely to further boost the use of pallets in the Indian market. All these factors are likely to boost the growth of the India pallets market over the forecast period. However, decline in international trade and India being a labor intensive industry is likely to hamper the growth of the India pallets market. In addition, a lack of proper warehousing infrastructure is likely to restrict the growth of the India pallets market. Environmental concerns over the use of wooden pallets may also restrict the growth of the India pallets market as majority of pallets are made of wood in the Indian market. One of the major trend in the India pallets market is the usage of pallets in large chain retail stores. Most of the key players operating in the India pallets market adopt pallets for the transportation of their products. On the basis of materials, the India pallets market can be segmented into wood, composite wood, plastics, metal, and paper. The metal segment is further sub-segmented into steel and others (aluminum). The Wood segment accounted for a major share in terms of value in 2015. However, the Plastics segment is likely to register a relatively high CAGR during the forecast period. On the basis of structural design, the India pallets market can be segmented into block pallets, stringer pallets, and customized pallets. The block pallets market in India is estimated to grow at a significant CAGR during the forecast period. On the basis of end use, the India pallets market can be segmented into pharmaceuticals products, chemical & petrochemical products, engineering products, textile & handicrafts, agriculture & allied products, leather products, marine products, and others (food and beverage). The engineering products segment is expected to dominate the market in terms of value and volume during the forecast period. The India pallets market is highly fragmented with the unorganized sector accounting for a majority of the market. Some key players identified in the India pallets market are Mekins Group, Saraswati Engineering Limited, LEAP India Pvt. Ltd., DNA Packaging Systems, Spanco Enterprises, Doll Plast Pallets, Schoeller Arca TIME Material Handling Solutions, B.D. Industries (India) Pvt. Ltd., and Aristoplast Products Pvt. Ltd.
B.D. Industries (India) Pvt. Ltd.